Attractions: Beaches and outdoor activities. Archaeological and historic interest zone. Activities: Hiking, trekking, mountainbike, sport fishing, parapente, birds watch, scuba diving, swimming, surf, windsurf, jeep races, flora and fauna contemplation, photography. How to get there: Iquique-Peru: Land route, by Panamericana Highway from Iquique and Tacna. Bolivia-Arica: Land route, by Route CH-11 Tambo Quemado, that goes through Parinacota from La Paz, Bolivia. Weather: Desert weather, with homogeneous temperatures in the shore. The high media temperature is 27,4ºC and the lowest is 13,2ºC. The rain is almost inexistent having shore couldiness, with a high media of 0,2 milimeters. 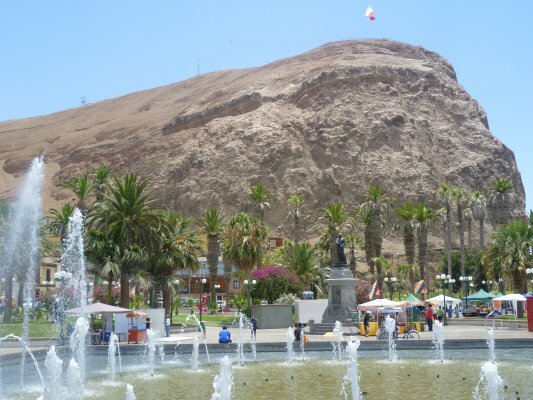 Services: Housing, food, transportation, outdoor activities, casino, parapente club, handmade crafts, museums. Surroundings: Camarones bay, Lluta River, Lluta geoglifos, Morro of Arica, Chinchorro beach, El Laucho Beach, La Lisera Beach, San Miguel de Azapa Town, San Lorenzo Pucara, Las Peñas Religious Sanctuary, Cardones Stream.